You had a flu shot this year. You watch your cholesterol, eat better, stay active, and brush twice a day. So why do you feel so rotten? In Headcase, edited by Stephanie Schroeder and Teresa Theophano, you’ll see that taking care of your mind is as essential as taking care of your body. If someone on the street saw you today, he might think you were at the peak of health. He can’t see what’s inside, though. Have we evolved, when it comes to mental wellness for the LGBTQ community? You might think so, after reading the chapters here: of a lesbian who received comfort from a therapist when her long-time friend wouldn’t stop bringing religion up. Of veterans who no longer have to conceal their sexuality. On fitting in with the local Mom’s Group when you’re the only “queer” mother and, by the way, you’ve already conquered postpartum depression. On being a lesbian daughter of a lesbian mother who was hospitalized against her will decades ago, only because she dared love another woman. That latter option doesn’t sound like so much of an option, does it? 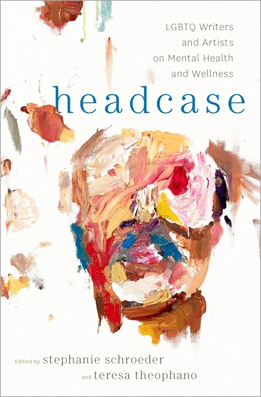 No, and Headcase, a title that comes from “reclamation” of a negative word, takes a real-life look at the first parts of Hicks’s sentiments: mental health, mental help, and the history of it all within the LGBTQ community. What you’ll learn won’t come easy, though. There are several distinct kinds of chapters inside Headcase, some easier to read than others. Readers will find arty things, poetry and drawings here. There are mini-memoirs of relevance. You’ll find short stories, too, many of which have a disjointed feel, as though you just wandered into a half-conversation. There are chapters that are plainly meant for physicians, which might not appeal to laypersons. And you’ll find history in this book, some of which – fair warning – will chill you. Overall, Headcase could offer comfort but it’s not a substitute for a doctor. It’s got subtle advice, but it’s not a therapist. It’s not even a good stand-in for a sympathetic friend but if you need direction, it’s worth a shot.